Leadership is the critical factor that determines the success of any business or department. The ability to select, manage, motivate, and guide employees to achieve results is the true measure of any leader’s success. In this fast-moving book, business expert Brian Tracy reveals the strategies used by top executives and business owners everywhere to achieve astounding results in difficult markets against determined competition. 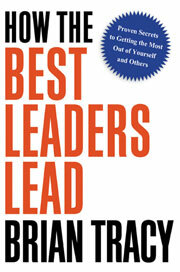 Brian Tracy has worked with more than 1,000 companies in 52 countries. In How the Best Leaders Lead, he gives you a series of practical, proven ideas and strategies that leaders and managers at every level can use immediately. They’ll learn how to: • Determine their ideal leadership style for any situation • Moti vate their people with the Three R’s – Recognition, Rewards, and Reinforcement • Set clear goals and objectives for themselves and others • Develop an exciting future vision for their business • Set priorities and focus on key tasks • Solve problems faster and make better decisions • Hire and keep the best people • Build, manage, and motivate winning teams • Communicate and get their ideas across to others • Motivate people in turbulent times • Identify opportunities and take concrete action • Plan for the future while managing the present With this timely guide, anyone can learn how to become a better and more effective leader and get more done faster than they ever dreamed possible.